Colophon: composed by Jamyang Chökyi Lodrö on the fifteenth day of the tenth month of the Fire Monkey (1956) year in the presence of the Gandhola (bodhi temple) in Vajrasana (Bodh Gaya), Magadha. Colophon: written by Jamyang Chökyi Lodrö in the month of Saga Dawa in the Fire Bird year (1957) in Sikkim on the first of the weekly ceremonies marking the passing of Princess Sangde. Colophon: written on the top floor of the Palchen Gyepe Temple on the twenty-fifth day of the seventh month of the Monkey year (1956). Colophon: written on the top floor of the Palchen Gyepe Podrang, the temple of the peaceful and wrathful deities in Lhodrak established by Guru Chökyi Wangchuk. Colophon: written on the first day of the first month of the new year of the Earth Dog (1958) by the one known as Jamyang Gawé Gocha in the Kachö Trulpé Podrang in Sikkim. Colophon: written by Jamyang Chökyi Lodrö on the first day of the month of miracles in the new year of the Earth Pig (1959) in Sikkim in the temple where the dakinis gather. Colophon: written by Chökyi Lodrö on the 22nd of the third month. Colophon: written by Tsuklak Lungrik Nyima Mawé Sengé at the beginning of his sixty-fifth New Year in a temple with the King’s palace. Colophon: This prayer by Jamyang Chökyi Lodrö made early in the morning of the first day of the Wood Bird year (1945) in Tashi Chime Drupe Gawe Tsal was written down by Drungyik Tsering Tashi. Colophon: Written in the tenth month of the Wood Monkey year (1944) having completed the approach and accomplishment practices for the Tersar Tukdrup practice of Tara. Colophon: written on the first day of the new male Earth Dog (1958) in the temple in Gangtok Sikkim by Jikme Namkhe Dorje Tsewang Drubpa Tsal. Colophon: by Lodrö Gyatso on the 18th day of the 5th month in the Fire Bird (1957) year in the Tashi Gepel temple in Gangtok, Sikkim. requested and written down by the Chöpön Chokden during a picnic in Darjeeling, Jampal Gawé Gocha said whatever came to mind. written on an auspicious day during the twelfth month of the Fire Monkey year (1956) on the banks of the Brahmaputra? river in Sirmaya ?? in India. Tsuklak Lungrig Nyima Mawé Sengé wrote this by moonlight and the light of a precious lamp during the first session of the night on the third day of the twelfth month while crossing the River Ganges in a boat. written by Chökyi Lodrö in a boat on the River Ganges during the tenth month of the Fire Monkey year (1956). written by Jamyang Gawe Gocha in Darjeeling on the 29th day of the 6th month of the Wood Earth?? ?Dog year (1958). written in earth?? dog year (1958) based on the double delusion of a dream experience. Colophon: this praise of the great Pandita Vanaratna which accords with the biography was written by Jamyang Chökyi Lodrö, who merely maintains the signs of being a bhikshu, in the eight month of the Water Sheep year (1943) in a break during a retreat. It was copied out by Drungyik Tsering Tashi. Colophon: composed by Jamyang Chökyi Lodrö or Pema Yeshe Dorje who has faith in the practice of Chö in front of an image of the red palace on the Copper Mountain in the garden that delights the wisdom dakinis on the rdzogs pa gnyis pa of the saga dawa of Fire Monkey year (1956). spoken by Tsuklak Lungrig Nyima Mawe Senge Tubten Shedrup Gyaltsen Pal Zangpo on the 15th day of the tenth month of the Iron Dragon year (1940) and written by the scholar of the West Namgyal Zangpo or Yangchen Gyepe Dawa. written by Jamyang Chökyi Lodrö on the first of the ninth month in the Iron Snake year (1941). Written by Chökyi Lodrö in the female Earth Pig year (1959) on the fifteenth day of the first month of miracles. Colophon: Written on the twentieth day of the second month of the Earth Dog year (1958) by Tsuklak Lungrig Nyima in Sikkim. written in the Labrang of Orgyen Mindroling monastery by Jamyang Lodrö Gyatso Tsuklak Lungrig Nyima Mawé Senge on the sixteenth of the second month of the Fire Monkey year (1956). written in Gangtok in Sikkim on the first day of the seventh month of the Fire Bird year (1957). Colophon: written in the Fire Bird year (1957) on the 15th day of the month of Saga Dawa by Jikme Namkhe Dorje Tsewang Drubpa Tsal. Colophon: by Jikme Namkhe Dorje. Colophon: written at the request of Kathok Khenpo Asher by the lowest of this lord’s disciples Jamyang Lodrö Gyatso Tsuklak Lungrig Mawe Senge. Colophon: written by the worst and dullest disciple Jamyang Chökyi Lodrö when Tsangsar Choktrul Rinpoche, an emanation of the Lord of Compassion, said there was a need for something to recite in the assembly. Colophon: written in Sikkim by the dull practitioner Lodrö Gyatso, who was cared for by this supreme master with immeasurable kindness. Colophon: A letter arrived on the 8th day of the 11th month to say that this great khenpo of unrivalled kindness had passed into the dharmadhatu on the 27th day of the tenth month of the Water Sheep year (1943). Then the respectful disciple Jamyang Lodrö Gyatso wrote this with one-pointed devotion during a break in his recitation. Colophon: At the request of his own student, Yakzewa Gyurme Drakpa who offered an auspicious scarf, silver wheel and staff shaped like a jewel, this was spoken on the 30th day of the 11th month in the Fire Bird year (1957) before the Bodhi temple at Bodh Gaya by Jamyang Chökyi Lodrö and written down by Drungyik Tsering Tashi. written by the one who holds the name of Khyentse’s incarnation, Jamyang Chökyi Lodrö or Pema Yeshe Dorje while on pilgrimage in India…. Yerpa—written by Jamyang Gowe Gocha on the 17th of the tenth month in the Moon cave. 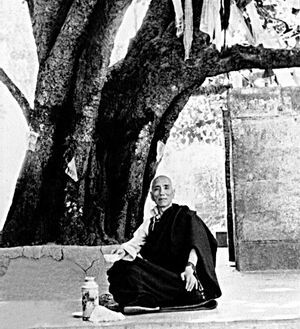 Lhodrak—by Rigdzin Ösal Kunzang Nyingpo Tsal in the Fire Monkey year (1956) while travelling to this very place on the tenth day of the monkey (7th) month. Based on an experience (? Snga phyir nyams kyi brdzun ris?) whilst making offerings and prayers at the Bodhi temple in Bodh Gaya on the 5th of the 12th month of the Fire Bird year (1957), this was written in the holy place known as Rajgir in the region of Vulture’s Peak mountain on the seventh of that month. Written by Jamyang Chökyi Lodrö on the fifteenth day of the tenth month of the Fire Monkey year (1957) close to the Bodhi Temple. Written by Kunzang Ösal Nyingpo in the Water Snake year (1953) on the fifteenth day of the tenth month. Written by Pema Yeshe Dorje in the tenth month of the Fire Monkey year (1957) when seeing the Lotus Lake of Zahor (Tso Pema). written on the tenth day of the monkey month (7th) of the monkey year (1956) in Lhodrak Kharchu Chakpurchen. Written on the fourteenth day of the first month of the fire bird year (1957) by Pema Yeshe Dorje in Sikkim. Colophon: In response to the daughter of the great Lakar family of benefactors, Tsering Damchö Drönma, whose mind is rich with faith and who has pure samaya, this was written by that mere reflection of a vidyadhara Pema Yeshe Dorje, or Jikme Namkhe Dorje Tsewang Drubpa Tsal on the (second dga ba of the dkar phyogs) of the twelfth month of the Fire Pig year (1947). Colophon: Written by Jamyang Chökyi Lodrö in Gangtok at the request of Yönru Tersé Lama Jamyang Sonam. Colophon: written by Chökyi Lodrö at/for Orgyen Tso (the lake of Orgyen). Colophon: Chökyi Lodrö wrote this for his own benefit. Colophon: Written on the third of the tenth month in the year of the Fire Monkey (1956) after reading the biography of Chandragomin in an account of the history of Dharma in India. Colophon: Written in the Moon Cave in Yerpa on the sixth day of the twelfth month. Requested by Pema Chöpel, the supreme tulku of Samdrup Monastery. *Written in a garden near Lhodrak Sekhar Trulpe Lhakhang at the request of the devoted Lama Chokden. Colophon: When Lakar Sogyal playfully asked me to write something like this Jamyang Chökyi Lodrö wrote this in the monastery of Tsurphu Tölung in the lama quarters known as Display that Delights the Lord of the World in the temple of the three doors of liberation. Written by Pema Yeshe Dorje in the palace of celestial dakinis in Sikkim on the 5th of the 12th month of the Fire Bird year (1957) when experiencing unshakeable devotion for the great omniscient one. Written by Chökyi Lodrö on the 29th of the twelfth month as words of aspiration. A prayer made on the 18th of the eleventh month. Written by Pema Yeshe Dorje in the palace of celestial dakinis in Sikkim on the (dkar phyogs kyi bzang po gnyis pa) following a visionary experience I had on the sixth day of the first month of the Earth Dog year (1958). When I had almost finished writing it a monk from Tsurpu called Karma Tendzin Trinle brought a young boy for the hair-cutting ceremony and I gave him the name Karma Shedrup Dargye…. Colophon: Requested by the monk Kunga Rabgye and written by Jamyang Lodrö Gyatso on the tenth day of the ninth month. Colophon: The seed for this was written by Jamyang Chökyi Lodrö on the eighth day of the ninth month of the Iron Dragon year (1940) based on faith and a minor dream experience…. Colophon: Following the request from Yakze Lama Gyurdrak, Chökyi Lodrö wrote this in the monkey month (seventh) of the Monkey year in Druptso Pema Ling and then finished it in the great centre of Lhalung Chödra. Colophon: Jampal Gawe Gocha wrote whatever came to mind on the ninth of the fifth month of the Earth Dog year (1958). Colophon: In response to the request from this great master’s own student Ngawang Chönyi, Jamyang Chökyi Lodrö spoke these words in the omniscient Longchenpa’s cave at Gangri Tökar and they were written down by the disciple Gyurme Drakpa. This page was last edited on 4 January 2019, at 10:12.